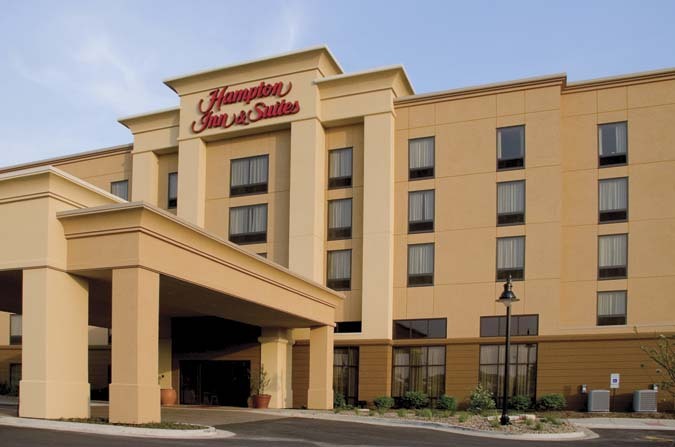 Meeting Space: 1,000 sq ft Total Units: 128 The Hampton Inn & Suites is located at The Shoppes of College Hills shopping plaza and within walking distance to several near-by restaurants. We offer flexible, state-of-the-art meeting space to accommodate your groups from 2 to 70. Adlai Stevenson I & II can be divided into 2 separate meeting rooms, or leave it open for a perfect, small business conference. Hampton?s Jesse Fell Board Room seats up to 11 and is complete with ergonomic comfort, privacy, is technologically equipped, and is perfect for smaller groups making executive decisions! Choose snack selections from our Snack and Beverage Menu or feel free to cater in, or bring in what you'd like!